One of the most popular additions to any Christmas celebration, poinsettias are a festive plant like no other. You can get hold of these fiery red plants from SerenataFlowers.com with new pale pink varieties becoming more popular for the holidays but how can you make sure the plant you pick is the best one. Originally from Mexico, it was the early missionaries to the country who fell in love with this vibrant plant and associated it with their Christmas celebrations. Later on, US Ambassador to Mexico, Joel Poinsett, after whom the plants are named, brought them to America and started a festive trend which would soon cross oceans. When you go out to select your Christmas poinsettias, make sure that you give yourself enough time to do it properly so that you can examine the plants thoroughly. Certain features affect the shelf life of a plant and show how healthy it is. When picking up your holiday plants, take care to choose one which has dense, dark green foliage and a few clusters of tight buds which can bloom over the weeks giving your poinsettia new life. Look closely to ensure that the yellow buds in the flower center have not shed pollen but are still fresh. This indicates that the poinsettia is young and in its prime. It goes without saying that you should not buy a plant with discolored, drooping leaves or one which shows evidence of insects or disease. Chances are, like most of us around the holiday season, you’ll be doing a few festive errands in one morning or even an entire day. If so, it`s wise to leave your poinsettia shopping until last otherwise your plant may not react favorably to being left in a cold car for several hours while you pick up additional seasonal goodies. If this is unavoidable, ask the store to bag the plant securely so that it will be protected from the cold temperatures somewhat. Remove these as soon as you get home. 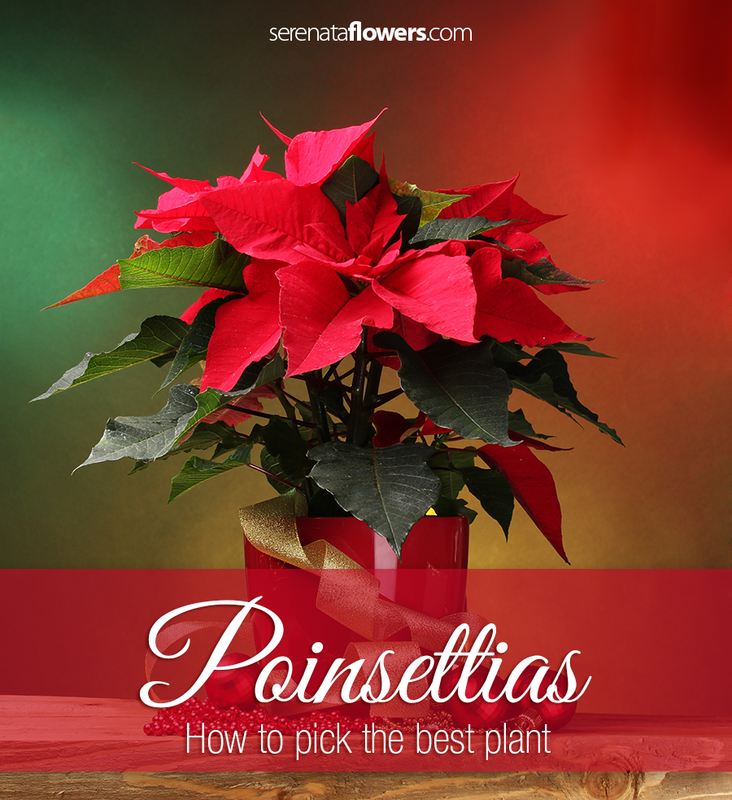 With a little forethought and care, you`ll have bright and blooming poinsettias for the entire holiday season. I have last yesrs poinsetta but although lotss of leaves no red bracks.can you tell me why? Hi Lorraine, to help to turn the leaves red you need to eliminate its light. Flower formation is triggered by periods of darkness. During the day, poinsettia plants require as much bright light as possible in order to absorb enough energy for color production. At night, however, poinsettia plants must not receive any light for at least 12 hours. Therefore, it may be necessary to place plants in a dark closet or cover with cardboard boxes. Try that, hope it helps!